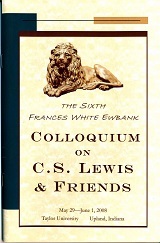 The most casual reader of C. S. Lewis and J. R. R. Tolkien knows that Narnia and Middle-Earth are steeped in mythology. What isn’t as well known is that both men saw a clear connection between their Christian faith and the ancient “pagan” myths that inspired their work. Whereas many Christians find the world of pagan mythology disturbing—and sometimes for good reason—I would like to show why Tolkien and Lewis believed what they did. Myths are not a hindrance to Christianity when understood properly; they are, instead, what Tolkien once hailed as humanity’s “rags of lordship.” In order to defend this thesis, I will be examining the life and work of these two men, showing the audience exactly what they believed and how they applied those beliefs to their fictional worlds and to the world of mythology in general. In the essay "The Funeral of a Great Myth," C.S. Lewis distinguishes "evolution" (popularly taught as science) from what he labels the "Myth." In science, evolution is a theory about biological changes. But in the popular Myth we find a tightly crafted story that does not limit itself to mere biological adaptation, rather it goes much further to claim a formula of upward and onward "universal improvement" in diverse fields that are well outside the materialistic limits of biology. According to Lewis the Myth believes that "Reason has 'evolved' out of instinct, virtue out of complexes, poetry out of howls and grunts, civilization out of savagery, the organic out of the inorganic..." Today it even encompasses the rise of the machine (or computer) age and Big Band cosmology. It favors such mantras as "newer, faster, better, cheaper." It states that in the name of progress anything "old" is by definition inferior, backwards, ignorant, or ill informed. Lewis challenges the self-contradictory tenets of the Myth. For example, one can not claim that reason somehow evolved from an entirely mechanistic, materialistic process. He explains that there can be no validity to a reason that has randomly evolved. The talk will introduce or perhaps reacquaint the audience with his powerful critique of the Myth. The fiction of J.R.R. Tolkien has captivated readers for the past five decades, perhaps because it portrays a world so drastically different from our own. Middle-earth is indeed informed by vestiges of an ancient tradition, preserved in the mythologies of different cultures. One very good example of this is Tolkien’s theory of courage, which he gleaned from Old Norse myth and discussed in his lecture “Beowulf: The Monsters and the Critics.” In brief, the gods and their human allies, the heroes of Norse mythology, know that eventual defeat is inevitable. However, this does not make their actions any less righteous nor allow for defection to the side of the giants and monsters, which will be victorious in the end. Heavily influenced by ancient mythologies, Tolkien develops his theory of courage through the heroes and the villains in The Lord of the Rings.